Cholesterol? Isn’t that something only my parents worry about? Actually, if your family has a history of cholesterol problems you may have to worry too. The CDC recommends preventative blood cholesterol screenings in young teens who are at high risk of developing heart disease; those who smoke, are obese, have diabetes and a family history of heart disease. If you have high cholesterol your doctor can recommend lifestyle changes and medication to lower your levels. There are two sources of cholesterol in our bodies. The first source is our bodies themselves. Your genes and family history determine how much it makes of the good and the bad cholesterol. The second source is the foods we eat. Too much LDL cholesterol in your body is bad because it can lead to heart disease, stroke and heart attack. Your body itself, influenced by your family genetics, determines how much of the bad and the good cholesterol your body will make. About 25% of the cholesterol found in your body comes from the food you eat. The American Heart Association recommends consuming no more than 300mg of dietary cholesterol daily. If you’re like me and enjoy starting off your day with eggs you should know that 1 egg has 186mg of cholesterol. What the yolk?! So if you’re getting a “2 over easy egg special”, know that you are consuming above the recommended intake of dietary cholesterol. Now don’t run to the fridge and begin chucking eggs yet. 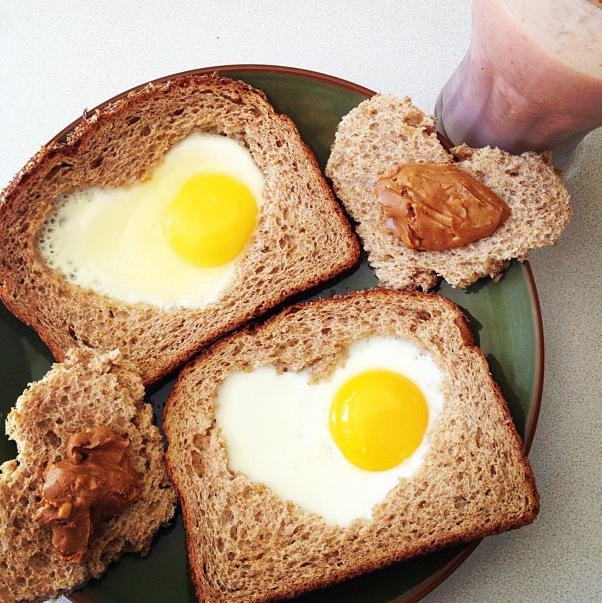 Eating those two eggs aren’t going to go straight to your arteries. It depends on your body (think genes) how much of that dietary cholesterol will actually raise the bad LDL cholesterol in your body. Also, there is an easy solution to get rid of cholesterol in eggs: just eat the egg whites. The egg yolk, the yellow stuff, is where all the cholesterol is found. Don’t know how to separate an egg yolk? Here’s a creative instructional video how: How to Separate Egg Yolk From Egg White? To maintain a healthy heart, you should make sure you are eating a healthy diet full of whole grains, fruits and vegetables and limited amounts of trans fats, saturated fats and dietary cholesterol. Fruits, veggies and whole grains have fiber, which aid in the prevention of cholesterol building up in your body. Remember fats? If you don’t, read up on them here: Reading a Nutrition Label: Part II. Trans fats, the worst fat for you are bad for two reasons; they raise your LDL and lower your HDL at the same time. Saturated fats are also bad for you for similar reasons. If you are concerned about cholesterol levels in your body you should stay away from trans fats, saturated fats and cholesterol. It is the combination of the three that affects your heart health the most. 1) Dietary cholesterol is the only thing that raises cholesterol levels in my body. False! Only about 30% of people’s cholesterol levels are affected by the levels of dietary cholesterol they eat. Remember! Your body itself, influenced by your family genetics, determines how much good and bad cholesterol your body will make. 2) If I eat eggs I am more likely to have a stroke or develop heart disease. False! Although 1 egg has around 180-200mg of dietary cholesterol, studies show that eating eggs daily did not elevate risks of heart disease or stroke. 4) I am worried about my cholesterol; I only need to worry about dietary cholesterol on the nutrition label. False! Trans fats, saturated fats and cholesterol together are all important to look at. For more information on cholesterol and heart disease, check out the American Heart Association.